Visiting Bulgaria, Europol director Rob Wainwright said that he was impressed by the country’s progress against cigarette smuggling and human trafficking, public broadcaster Bulgarian National Radio said on March 31. After talks with Bulgarian Prime Minister Boiko Borissov, Wainwright said that Bulgarians would be taking part in two new special units, against terrorism and against human trafficking. Borissov said that the Bulgarian officers would be in managerial roles. Wainwright said that Europol would continue to assist Bulgaria in the fight against terrorism and corruption. He said that following the terrorist attacks in Paris and in Brussels, the services were working very effectively against terrorist networks that were supported by channels run by highly-placed international crime syndicates. Borissov said that information was constantly being shared. He declined to comment in detail on reports in the Serbia media, citing what were said to be sources in French intelligence, that terrorists were passing through Bulgaria, but added a note that after the recent bombings in Paris, Bulgaria had arrested one of the organisers. 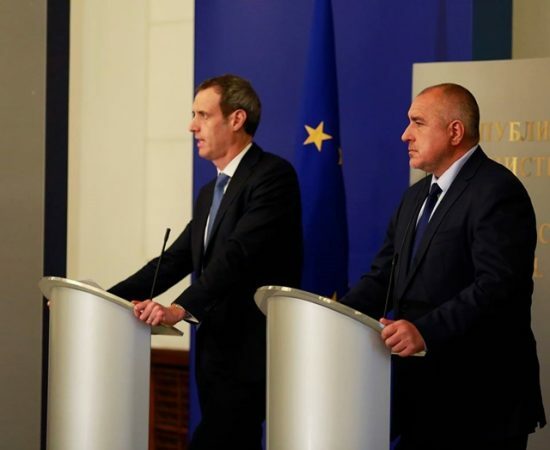 Borissov said that it was not surprising that Bulgaria was being given two seats in the specialist units being set up by Europol. “Nowhere else were 200 traffickers arrested,” he said. “The fact that we make a great effort to protect the country, and our security services are working well, is noticeable and so we are the preferred partner in this field,” Borissov said. He said that a few days ago, the Greek authorities had prevented the departure of 500 refugees to the Bulgarian border. Bulgaria was minutely monitoring movements at these centres, Borissov said. He insisted that, in contrast to what had been alleged in foreign media, there was “no inhuman treatment” of those who violated the country’s borders. He said that Bulgaria had sent dozens of trucks with food, water, blankets and firewood to Macedonia and Greece “because we are human”. “Is it human to let them in the country and leave them in mud puddles, as in Greece,” Borissov said.